Continuing the tradition of lag-time with cooking and then actually posting things … Monday evening was the start of Passover and while I’m not actually Jewish, I do love an excuse to cook different things. I was looking through the NPR cooking blog, cause that’s what I do for fun, and I found a really cool looking passover recipe: casseroles with matzo instead of noodles or crust. Kinda like a matzo lasagna. There were several versions that were vegetarian, but I went with the asparagus/leek one. As with everything I tend to cook – I didn’t follow the recipe quite exactly. I could not find mint at Whole Foods, which was of course tragic, so I had to omit that. I also forgot to buy leeks, so I just substituted onions. You can do that with any recipe that calls for leeks, it really doesn’t make a huge difference. I did however splurge on some really nice ricotta cheese. My god, ricotta is usually a fairly indifferent ingredient, but this is good enough to just eat by itself – which I’ve been doing until I find a good ricotta recipe. Can’t let high-quality ingredients go to waste. I also added peas because I felt it needed more veggies than just asparagus and I didn’t have any spinach and some fontina cheese cause I had it and it works well with asparagus. The result one one of the best fillings I have ever concocted. Seriously, it was ridiculous. The eggs and cheese mixed together really thoroughly. And the lemon zest added a really lovely touch – I think it may be my new favorite thing to add that adds the special oomph to a dish. Like any experiment it wasn’t perfect. The egg to vegetable ratio was a little off, I think adding a bunch of spinach would be very helpful next time around. The filling to matzo ratio was also a bit off. 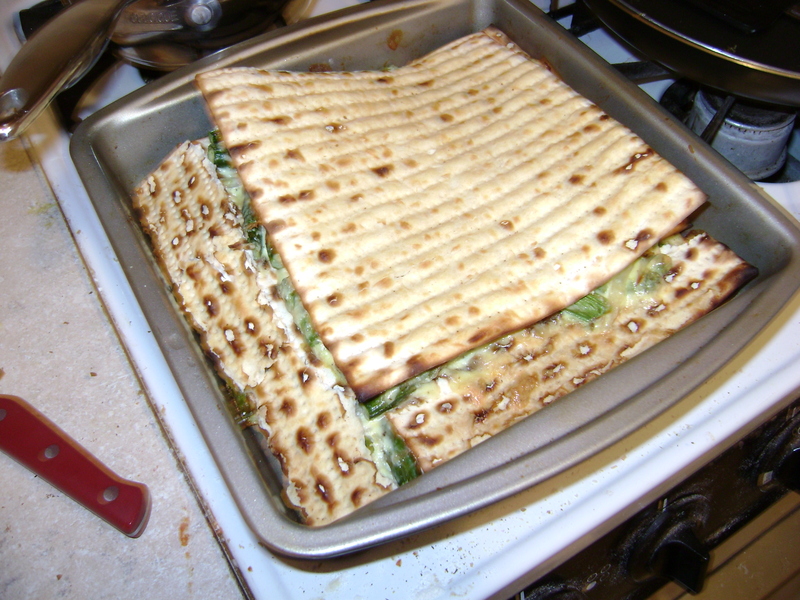 Too much matzo, not enough filling, which made it a bit drier and denser than I would have liked. I’m thinking of trying next time around with pie-crust, or possibly phyllo, instead of matzo. At this point its about taking a really good recipe and making it spectacular.